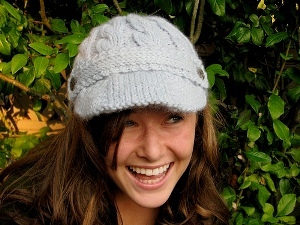 You can find the pattern for the Capitan Hat, that Kaitlyn is modeling beautifully, right here. For Anina’s hat, she used Diamond Luxury Baby Alpaca Sport which is a wonderfully soft, chunky alpaca. We love this yarn so much that we’ve added three great new colours to our shelves this season. 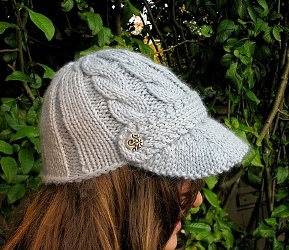 This hat is an easy and fast project, knit on 6mm needles. She finished it off perfectly with some gorgeous Annie Adams buttons. We have a big selection of her buttons, shawl pins and buckles. Other yarns that could be used for this hat are Malabrigo Chunky (soft as butter! ), Misti Chunky Alpaca, and Louisa Harding Ca’d’oro. For a more structured hat, try doubling the Cascade 220. Try it out and send us your photos! Both stores will be open today from 12-5pm! This entry was posted on Monday, September 7th, 2009 at 8:13 am	and is filed under Baby Bamboo, Uncategorized. You can follow any responses to this entry through the RSS 2.0 feed. Both comments and pings are currently closed.